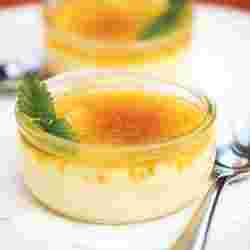 Fancy schmancy: Crème Brûlée seems like an intimidating dessert to make. Crème Brûlée is one of those desserts that you usually only have in fancy restaurants because the thought of making something that sounds so fancy and seemingly so complicated, is just too intimidating. For those of you who do have access to the occasional foreign product, either brought by yourself on a foreign trip or from some other source, the French company Elle a Vire does a fabulous Crème Brûlée in a Tetra Pak. You pour out the custard, heat it and pour it into ramekins (little bowls with straight edges) or bowls. After a couple of hours of refrigeration, you have a perfect custard that is ready to have some sugar sprinkled on it and put under the grill. I have used the product on several occasions and it comes out perfect every time. A restaurant’s dream come true. A proper Crème Brûlée should have a crackle-crisp bittersweet sugar crust (not one you have to tackle with a pickaxe). The texture should be light, silky and supple although the dessert is rich. It is a masterful combination of temperature, taste and texture. As for the baking of the custard, you must cook the custard in a water bath or bain marie in the oven. This will result in a smooth, silky texture and not a grainy, curdled mess. For the topping, use brown or demerara sugar and a small torch (grilling it under a grill or in an oven may destroy your custard’s consistency). You can buy these at any kitchen section of department stores abroad and they are, believe me, indispensable for this dish. Once you have mastered the basic recipe, you can add your own touches by adding flavours such as coffee or cinnamon in the cream. What you must achieve every time though is a shattering sugar crust beneath which lays an interplay of creamy, cold sweet, bitter, smooth and perfect. Combine two cups cream, sugar and salt in a saucepan. Scrape seeds from the vanilla pod and submerge both in the cream. Bring to boil over medium heat, until the sugar dissolves. Take off the heat and leave to infuse for 15 minutes. Place a kitchen towel in the bottom of a large baking dish or roasting pan. Arrange 8 ramekins or small bowls in it. Add the remaining cold cream to the hot one. If using vanilla extract, add at this point. Whisk yolks in a large bowl. Whisk the cream little by little into the yolks. Pour or ladle into the ramekins. Pour boiling water into the roasting pan until water reaches two-thirds height of the ramekins. Bake until the centre of the custards are barely set—about 30 minutes on 150 degrees Celsius. Remove the roasting pan and then the ramekins. Cool to room temperature, then refrigerate, covered, for at least four hours and up to four days. When you are ready to serve, sprinkle each one with 1-1/2 tsps of brown sugar. Ignite the torch and caramelize the sugar evenly. Refrigerate once more, uncovered, for about 30 minutes. Serve.